An American Oystercatcher seen at Milford Point during the summer. Most birds make a statement with their plumage, be it with bright and flashy colors or muted, subtle tones. Some birds stand out from the crowd with other features, such as the heron’s long legs, the Atlantic puffin’s oversized bill, an owl’s huge eyes, or the northern mockingbird’s incredible repertoire of songs. One New England bird seems to make a statement with everything it does. The American oystercatcher is large, has handsome brown, black and white plumage, has strikingly colorful features, and is loud and conspicuous. Despite all this, the oystercatcher still seems to fly under the radar of the birding world’s consciousness. It is strictly a coastal bird and is somewhat wary, so the inland or casual observer of nature may rarely see one. It is common enough that serious birders do not consider it an out-of-the-ordinary sighting and uncommon enough that non-birders likely wouldn’t recognize it if they came across one. I see oystercatchers frequently and never tire of them. American oystercatchers are large for shorebirds, about the size of a fat crow. They have black heads, brown backs and white underparts. The wings show flashes of white when the bird is in flight. The bill is the oystercatcher’s most distinguishing feature as it is long, thick and bright red. The bill is capable of prying open the shells of oysters and other coastal delicacies. American oystercatchers’ eyes are a spectacle unto themselves. While many birds simply have black beads for eyes, the oystercatcher has large bright yellow eyes with a black dot in the middle. The eye is also surrounded by a thick bright red eye ring, similar to that of a wood duck. If all that weren’t enough, oystercatchers are one of the more noisy birds along the coast. Spend enough time at a coastal beach — either on Long Island Sound or Atlantic Ocean — and you’ll become familiar with the oystercatcher’s repeated piercing “weep” call. I was on one of the islands off the coast of Connecticut recently when I heard the unmistakable call of the oystercatcher. I turned to see seven oystercatchers flying in unison to a nearby island. They breed extensively along the coast and nearby islands of Fairfield County and this flock was likely a new family or two. Young oystercatchers look similar to adults, but have dull bills instead of the trademark red bills. When I volunteered to monitor piping plovers years ago, I came across baby oystercatchers a few times as well. The fluffy white balls of down would freeze and hunker among the rocks when they noticed me. If I hadn’t noticed their movement prior to their freeze response, I would never have seen them as they blended in perfectly with the small rocks on the beach. It makes me wonder how many I actually did miss. At that size, they are extremely vulnerable to predators — such as gulls — as their parents leave the chick so as to not attract attention. I made sure to make a quick exit from the area when I noticed the chicks. The last thing I want is even less red-billed, yellow-eyed American oystercatchers on our beaches. 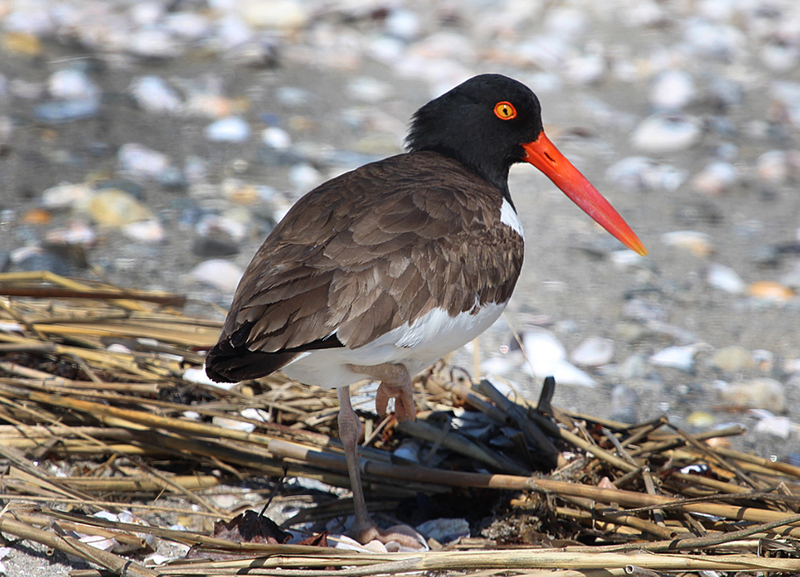 This entry was posted in For the Birds column and tagged American Oystercatcher by Chris Bosak. Bookmark the permalink.